Enter today by clicking the icon below. But hurry, the giveaway ends on March 6. The winner will be announced at Rhonda's Facebook Live Party. 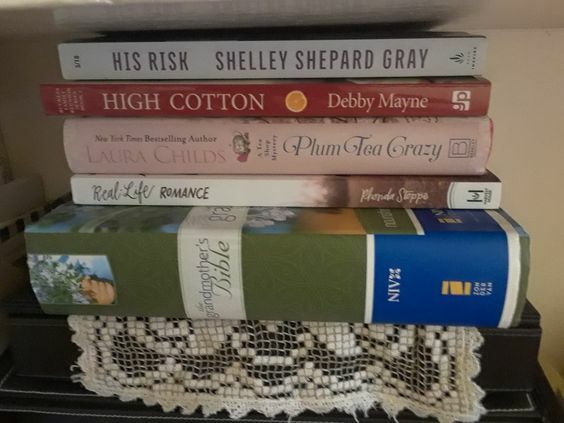 RSVP for a chance to connect with Rhonda and other readers, as well as for a chance to win other prizes! In a world of broken relationships and hurting people, it can seem like all we ever see is heartache—that marriages are doomed from the start and romance isn’t worth the risk. Don’t let the world define romance for you! See how God is at work in the hearts of His people—knitting together hearts in a love that forever endures. This book is filled with 25 different true stories. Stories from Love at First Sight to 2nd Chance Love Stories and many in between. From the 'Maybe we should try church' couple. To the 'Surprise by Love' couple. And many many more stories in between. to invite God into their marriages. Each story ends with thoughts to ponder and questions to ask yourself. The book is written for the believer and non-believer and ends with the plan of Salvation inviting the reader into a personal relationship with Jesus. 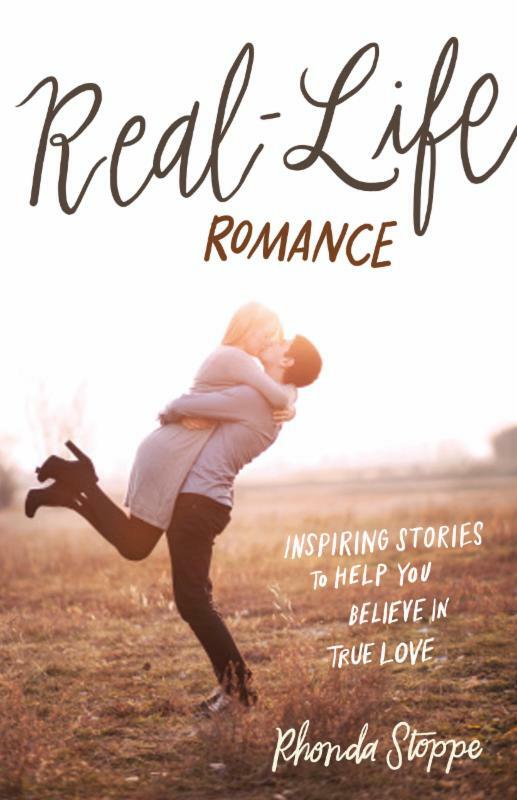 Real Romance is and uplifting and inspiring; a great read for everyone. This review will appear on retail sites and Good Reads. Leslie | Did you Hear About the Morgans? I love Sunday Supper. It's a day/evening in our home of either a super simple relaxing meal. Or one when I pull out all the stops. Super Simple meals might be nachos from left over chicken or steak. Or a new one found on Pinterest or another blog. his yummy sounding recipe at the Fabulous Party. his blog and check out the recipe! It's a day that usually nothing happens after church so an afternoon of cooking is perfect. Spending time in the kitchen chopping and mixing and cooking is fun and relaxing to me when I'm not tired. It's not typically a meal with a fancy set table. Or even china. But maybe a meal with special dishes or the table set for a theme. paper towels for the napkins. One of our favorite meals! 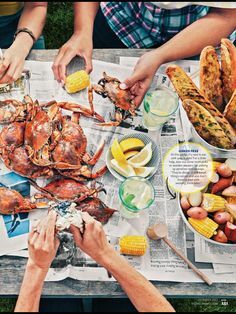 I wonder why we seem to always have a seafood boil on the weekend. It's such a super easy meal! Everything thrown all in one pot eaten mostly with your fingers except for the potatoes. Oh I am getting hungry! Or it might be the night I decide to cook a super pull out the stops meal that has a ton of ingredients and alot of work. 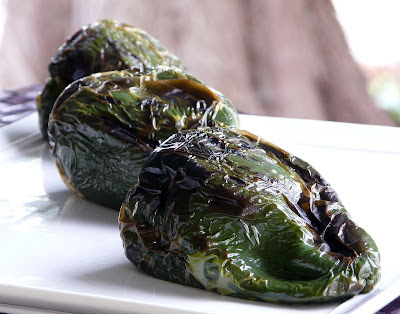 Chili Relleno's start with fresh poblano peppers that have to be charred or steamed in the oven and then seeded and stuffed with Monterrey Jack Cheese (Mozzarella works in a pinch). A fritter type batter is prepared and then the chili's dipped and fried. Alot of work but oh so worth the effort! Oh so yummy. 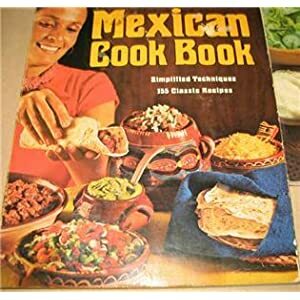 My recipe is from this cookbook bought way back in the day. It is full of wonderful yummy recipes. Or there is the option for the super easy version. I use on week nights when I am tired but craving one of my favorite dishes. Not quite the same but still super yummy. I cut the recipe in half for just two of us and then there are leftovers for lunch. Oh I enjoy Sunday Suppers. A great time for making some great food and enjoying it with family or friends. So what's on your Sunday Supper dinner plate? Super simple or pull out the stops and spend the day cooking? Linking with a few more parties. Link up any day, any time! I sure do hope the Cat In The Hat doesn't sneak in! Fabulous Party. This sounds so good I am trying tonight! I really need to re-think the whole menu thing. Lot's of changes going on here. The Cowboy is officially retiring which means he's home for lunch. Which means I need to have food for lunch planned or he'll eat leftovers planned for later in the week! Here's what I am trying for this week. As I've said before. The same ole same ole. I need some menu ideas! Puddles, hyacinths,crocus, lettuce sprouts that may have drowned, potatoes and onions that probably drowned. So pretty these are for sale on Etsy. Click here. it was a lovely place to visit. 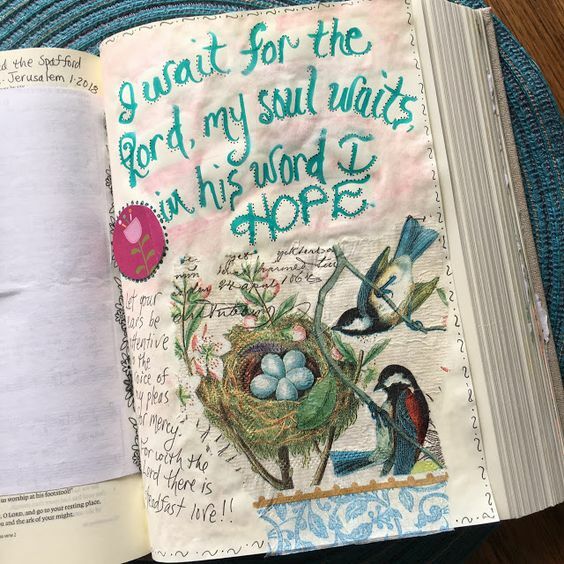 Constance shares scripture that she has journaled and illustrated. I hope you will go by for a visit. Click here. I think I could spend all day reading her lovely posts. Don't be mad Carol...I need help thinking what to call this prompt! not old but Carol's fun blog has been around a little bit. And she posted the most links at the Fabulous Party last year so that puts her blog in the 'old' category just because it's not new to me! But it might be new to you. Go over and see her at Comfort Spring Station. You'll find some fabulous recipes and much more! 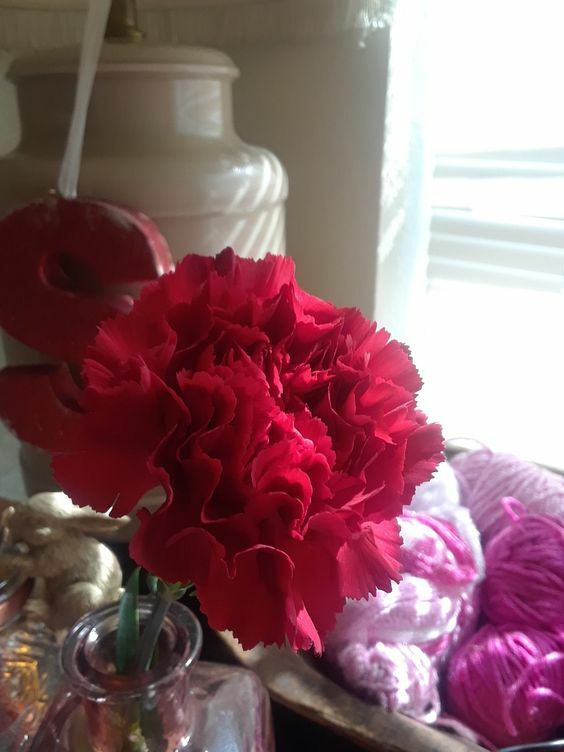 Click here to visit Carol! I am featuring Carol here today because I got a chance to visit with her and interview her for the Fabulous Party. I'll be sharing the interview soon. Curtains for master and living. Need to price rods. No real Ta Da this week. Just spent the week reading. I found this party this week. 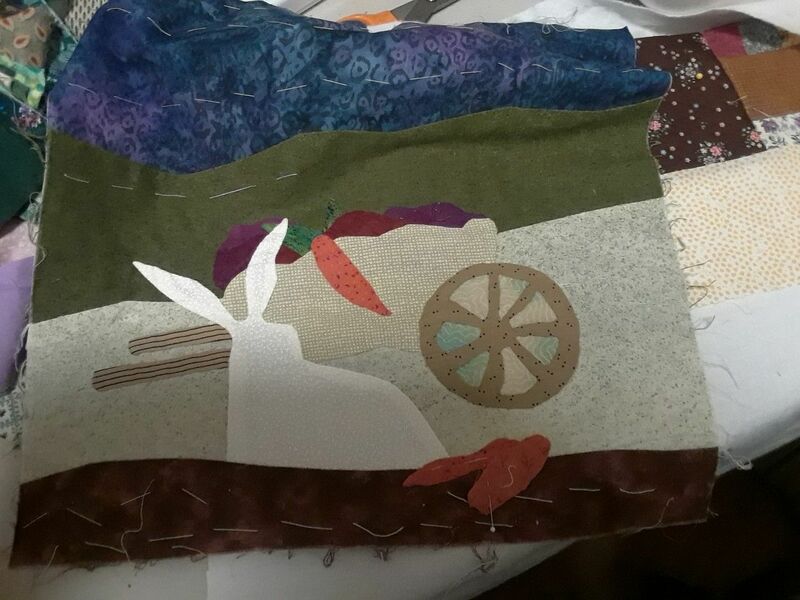 An applique quilt I need to finish. I will not tell you how old this block is. I have taken my time on completing because I wasn't sure about quilting it. Now I have the knowledge and I am ready to start! It's always so hard to choose which posts to feature! Go over to Ash & Eileen's at Just Measuring Up for the instructions. Click here. Suzy is a new visitor to the party. 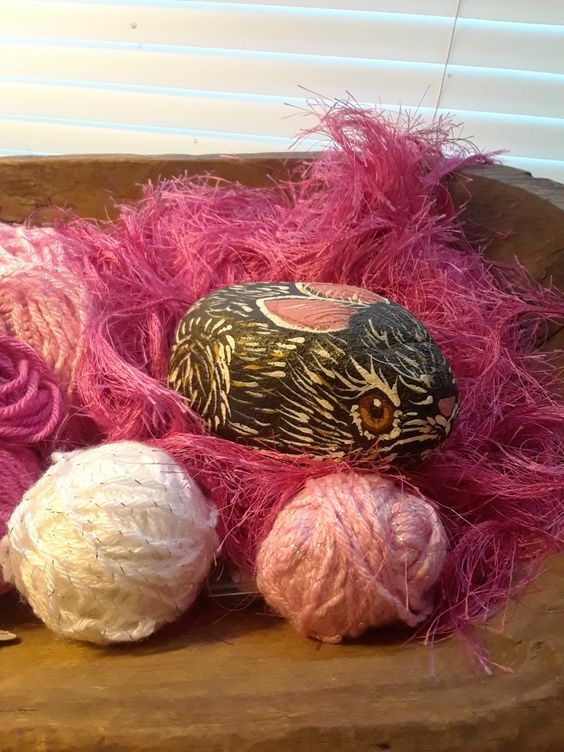 She blogs at Just Simply Somethings she shared a post about a craft that might be new to you. 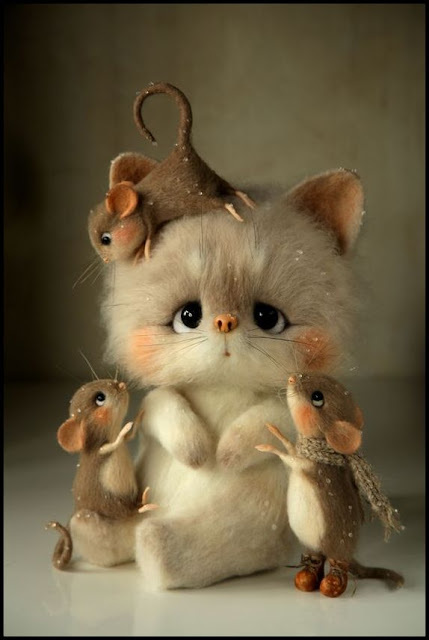 It is called 'Felting'.She shared the sweetest little creatures made from felt. Click here to read this fun post! I just know spring is around the corner. Little bunnies are showing up everywhere! I am so gad your here. Today is the perfect day to visit the blog. Today is a special day because I am featuring my Holiday blog. I wanted to tell you all about in case you haven't found it! everyday a holiday in our homes. And then something happened. I came up with this Fabulous idea. And the Fabulous party began. The Fabulous party is over a year old now. I thought well maybe it was meant to be and so I left it and began posting the party on both blogs. And made this button. It's supposed to look sparkly. Do you think it does? them on the side bar at Our Holiday Journey. 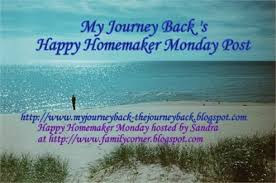 I also feature them here on my Happy Homemaker post. Sandra at Family Corner. Sandra provides the prompts. I have a added a few prompts of my own to make my posts more personal to me and the blog(s). Last January I did something different at Our Holiday Journey. I ran a 12 month giveaway. 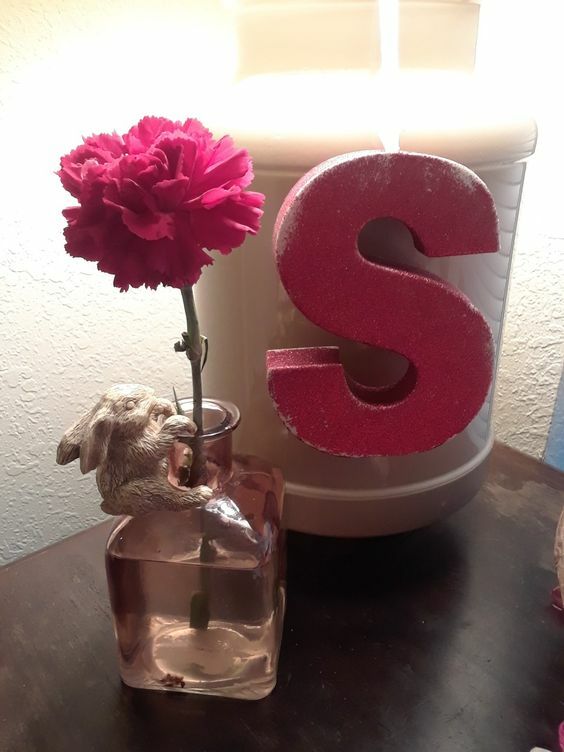 Each month I tallied links and the blogger that linked the most posts one a prize. Carol writes a delightful blog. She shares about living in Florida. 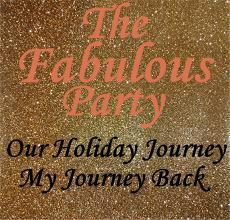 The Fabulous Party is supper simple to follow and link. I have intentionally made the party super easy to find (I hope). The party goes from Sunday to Sunday. You don't have to wonder when you can link. Any day. Any time. Building a community here and at Our Holiday Journey is important to me. I hope we'll become kind of a family. With all that said. I have made linking at the party simple. I am backtracking here but I didn't mention 'rules'. There are non. Well there is one and it's important. everyone I write a special Halloween post the week of Halloween to share the posts that I find that are not spooky or creepy and just fun. look forward to reading what crazy thing I just might be writing about. Sometimes I write random posts on My Journey Back. And sometimes I get off track . . . like now. I was going to share one more new thing I am planning. 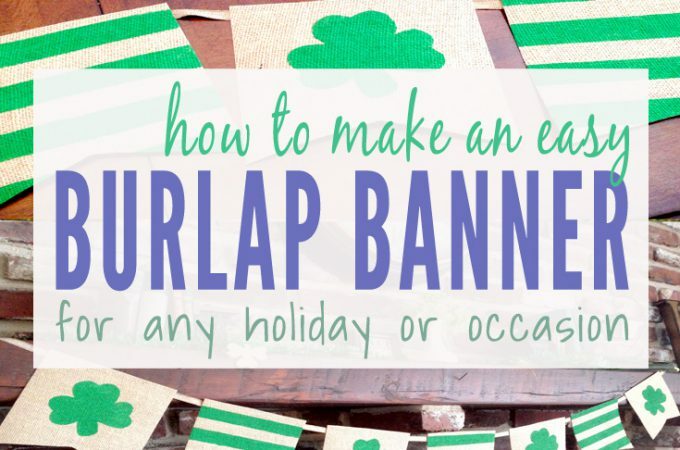 I am planning on writing and sharing your our posts about Holidays. Kind of getting back to what I originally planned. I have a whole list of parties that I link at. Below this post you'll see the list. If you have a party I would love for you to link at my party too! I hope you've enjoyed visiting today. Come back soon and let me know you came by!